The Tea Rose quilt block looked familiar to me and then I realized it is similar to Bear's Paw block, but it is a little more work. See if you can spot the difference between the two blocks. 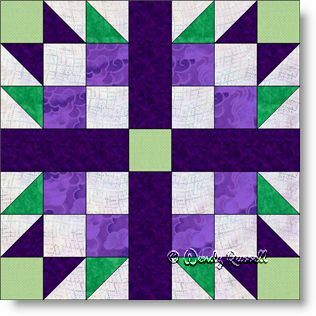 This seven patch block is still very easy to construct as it contains only the simplest of patches used in quilt making ... squares, rectangles and half square triangles. With patience and care to sew a precise quarter inch seam allowance, this block will go together in no time. The two sample quilts illustrated give very different looks, so your quilt design is only limited to your imagination. Enjoy!